In 1892, a stocky Danish immigrant named Magnus Jensen rode into south-central Montana. He liked what he saw and staked his future on the ranch he would carve there. Today, DAN AADLAND and his wife Emily live on the ranch built by Magnus Jensen, Emily's grandfather. More than a century has passed, but the nature of ranching in Montana is little changed. Sensitive to the timelessness of the land, author Aadland approaches his ranching life as Thoreau approached life at Walden. On the framework of one recent year, Aadland brings ranching to life. In simple but moving prose, he evokes the harsh beauty of the West, writing with as much elegance about breaking a colt as he does about the inner lives of cattle, the way his pickup handles in the snow, and how the relationship between a man and his horse often defines a good day on the ranch. 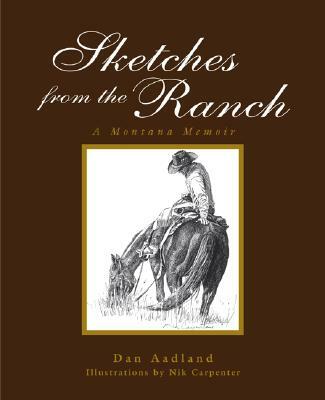 Beautifully illustrated, and lovingly told, SKETCHES FROM THE RANCH bears poetic witness to the myth and reality that is the West.